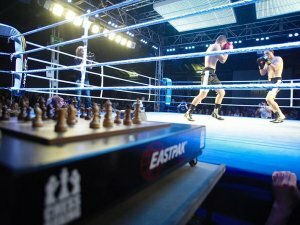 Chess Boxing has been in operation since 1992 and is a sport requiring both brain and brawn. Since 1992 the sport has gone global with countries including England, Germany, Netherlands, France, Russia and Japan all embracing the new sport. Players have to be skilled in both boxing and chess to compete at the highest level. The object of chess boxing is to either beat your opponent in alternate rounds of chess or boxing. Matches can be won from either discipline with the chess coming down to check mate or forfeit and the boxing in either a stoppage or points decision. Players go head to head in chess boxing and the match starts with a four minute round of chess. The players then go into the ring for a three minute round of boxing before again returning to the chess board. The match consists of 11 rounds in all (6 rounds of chess and 5 rounds of boxing) with 1 minute intervals between rounds. Each player has boxing gloves which are removed for the chess round. Head phones are given to the players when taking part in chess so not hear advice from the audience. The chess side of the game is played out over a 12 minute clock and is essentially ‘speed chess’. Officials may step in if they believe a player to be stalling in the chess rounds to force them into a move within 10 seconds. The boxing rounds are scored as per a normal boxing match on points. Unless the chess game has seen a conclusion – and this is very rare in the sport – then the game will go to count back on boxing points. In the event that the boxing is a draw then the win will go to the player playing the black chess pieces. To win you must either gain check mate or receive a withdrawal from the chess game. Alternatively you can knock your opponent out in boxing or win on points to receive the win if the chess is a draw. Players must not deliberately waste time when playing the chess discipline of the game. If the referees deem that they are then a 10 second penalty will be placed. Players must have an understanding of both boxing and chess disciplines. Players must have a chess rating of at least 1800 to compete in the sport. Players can win from either the chess or boxing rounds. 6 rounds of chess and 5 rounds of boxing will be completed unless the contest is stopped with a winner in a previous round.